Turning food waste into a useful resource: Methane generators, food scraps into animal feed, and composting. Food waste and Hunger: This one probably speaks for itself, but the issue of getting food that is heading to the bin rerouted is a more complex civil challenge than most of us realise. And while all three of these are great, not one addresses the problem of our excesses at grocery store, markets, restaurants, and anywhere where food is available (think weddings, conferences, amusement parks, banquets…). Thankfully, tomorrow is Earth Day and at least one reporter went a little deeper. The Star, a Malaysian paper, reported on a Toyota led initiative in that nation to help turn the next generation of Malaysians into solutions-focused Eco-Citizens. These sixteen year olds are not starting with the food waste already generated. No, they are looking at ways to reduce portion sizes in cafeterias and restaurants BEFORE people even buy the food. I like how they are thinking. And this brings me to an act of shameless self-promotion. On 20 May, Jean-Francois and I have been asked to join a interactive panel discussion to think about how excess contributes to the food waste problem and steps might be possible to curb it through grass-roots initiatives, technology, and individual actions. However, our experience is limited. If you could share your ideas, opinions and local solutions, it would help us in our brainstorming. I’d love to share your practical, non-compost, solutions with like-minded Angelenos. We’d also love to see you there. 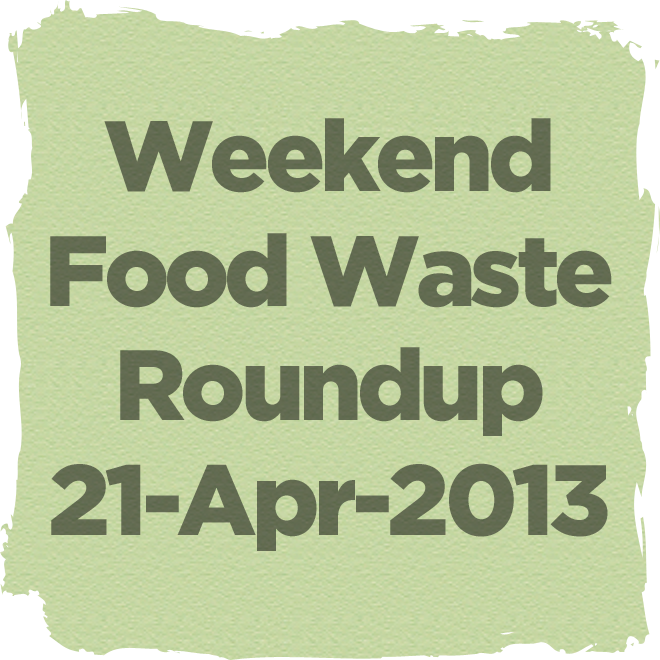 This entry was posted in Weekend reading and tagged China, food waste, news, roundup, sustainable living, trash, UN, wasted food, Yuan Longping by Bonnie Lee. Bookmark the permalink. Like you said in the post, start with the kids. A lifetime of change is what is needed. Agreed! My effort is reserved for the younger generations. Not only does it keep me from getting down (Texas is nowhere near California in environmental issues) it keeps me focused, and I occasionally get approached by my own or older generations as well, usually through their kids. I consider that a bonus! Forming life-long habits in young ones is a lot easier than changing old ones in adults. Kids can be quite persuasive when they see that the health of their future planet is on the line. They are full of passion — we just need to give them the right direction. After participating in the panel discussion on Food Waste, I think we need to do more than focus on youth. I think we also need a shift in how we view time spent in the kitchen and on household chores. People believe that running errands and cooking are time consuming, labour intensive, and uninteresting constraints on our free time. We’d rather pay for conveniences that give us more time to do other things, but I suspect that just means watching more television and playing more games. Cooking and shopping are ways to express creativity–but few people see or understand that. I just don’t know how to begin to shift that attitude. Yes, a conundrum indeed. Don’t let it get you down. The real problem with convenience is that the consumer is not paying all the costs associated with it. When that shift happens — and it will — change will be inevitable. We simply cannot continue to do this another 50 years. Already seeing the strain. Good thoughts, thanks for posting. Hi Bonnie Lee, I personally HATE food waste, it really bothers me and makes me angry to see people do it as if it were normal. I stopped leaving anything on my plate when I was maybe 13 or so because I used to think that wasting food was wasting my parents’ money so I didn’t want to do that. Now it’s not just for the money but because I am more aware of the time, effort and energy needed to produce every little bit of it and I feel lucky to be able to choose what to have every day so easily. In a more practical way, I think avoiding excess can be achieved for example by selling food according to its weight – in Whole Foods, when you buy a salad or meal, you select your container and then pay according to the weight, which I think is a quick to be more quantity-aware. Of course, awareness is key, because I hope that when people throw perfectly good food away they don’t know what they’re doing, because if they did then they would simply be a bit crazy and selfish. How did the panel go? I’m guessing (hoping) you’ll be posting about it. Posted a link to the panel this morning with today’s rant on popcorn. JF thinks it went well. I am less sure–I rambled a bit. But, met loads of new people and have a few directions to pursue to help us get better at reduce food waste in our homes. Popcorn? I went to the forum, but didn’t see the link. My interest is piqued.